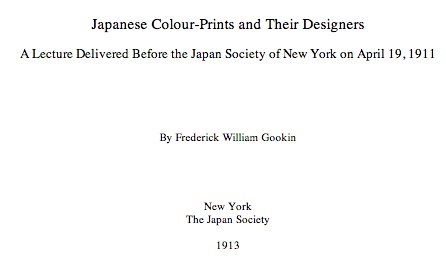 This e-book includes the catalogue of Japanese prints on loan for an exhibition held at the Japan Society of New York in April-May 1911. The accompanying lecture by Frederick Gookin was the opening event of that exhibition. I’ve selected three of the prints in this informative work together with excerpts relating to each of the artists. Primarily the charm of the Ukiyoé colour-prints is due to the fact that the leading masters of the school were artists of exceptional power. It is also due to the fact that most of them made print-designing their chief occupation, to which they devoted their thought, time, and skill, and that with rare exceptions they were less distinguished as painters. 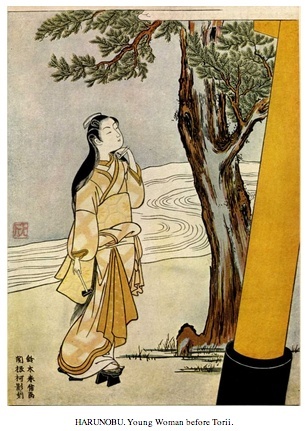 The name of Suzuki Harunobu is familiar to every admirer of Japanese prints. It is in large measure to his genius that the development of full-colour printing is due. He was not only the first artist to make use of the new process, but he took advantage of it to bring out prints of a novel type. Very dainty and graceful these were, and in the poetic allusions or quiet humour with which they were charged, and in the quality of the brush-strokes with which the drawings were executed, they made a direct appeal to men of taste. Success was instantaneous. 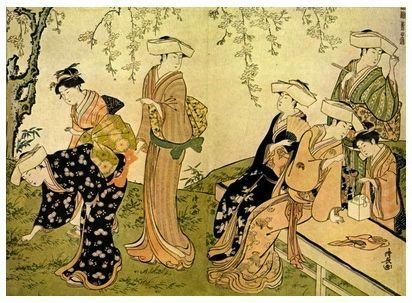 By the year 1765 Harunobu had come to the front and distanced all competitors for popular favour. The serenity and compelling charm of his compositions brought him wide fame. Realizing the possibilities that now lay before him, he proudly exclaimed, “Why should I degrade myself by the delineation of actors?” His ambition, he said, was to become “the true successor of the painters in the department of printing”; that is to say, to design prints that should be worthy substitutes for paintings. Instead of restricting himself to a few primary or secondary hues and the variations resulting from their superposition, he mixed his colours to get the precise tint desired, and he used as many colour-blocks as were needed for the effects at which he aimed. The Yedo-yé, or Yedo pictures, as the prints had been called from the fact that they were produced only at the eastern capital, were now denominated nishiki-yé, or brocade pictures, from the number of colours woven together in them. To the printing itself, the charging of the blocks with colour, the character and quality of the pigments and of the paper used, Harunobu gave careful attention, and these things were greatly improved as a result of his experiments. 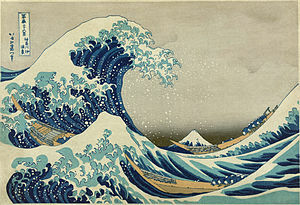 Best known for this image (via Wikipedia) – Great Wave off Kanagawa – created in 1820, Katsushika Hokusai was a master of wood block printing. Either Hokusai or Hiroshige might well engage our attention for an entire evening. Both were extraordinarily prolific; Hokusai was the more versatile and has the wider reputation. Both are among the greatest landscape artists the world has ever known. Their numerous prints of landscapes are a revelation of the possibilities of originality in composition and variety of interest in this field. Unless one has studied these prints in fine examples, it is impossible to realize how great is their merit. 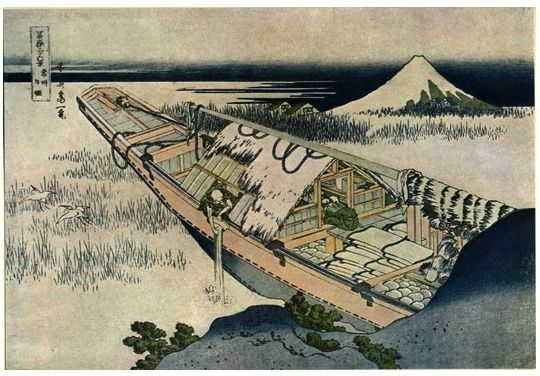 This is true of all the prints, but particularly true of Hiroshige’s. Between the best impressions and the very good ones the difference is really astonishing. But the best are so extremely rare as to make it probable that because of the difficulty and the cost of printing, very few of them were issued—the publishers finding cheaper editions more profitable. All, however, were surpassed a few years later by Kiyonaga, the last great artist of the Torii line and the culminating figure in the history of the Popular School. He conquered by the rugged strength and marvellous quality of his brush-strokes, by the richness of his colouring and the ripe mastery he displayed over all the resources of his craft. But also he created a new type of design—that which found expression in the great diptychs and triptychs that stand as the triumphs of colour-printing. At the height of his power his influence over his contemporaries was so great that, without exception, the younger men among them copied his style as closely as they could.